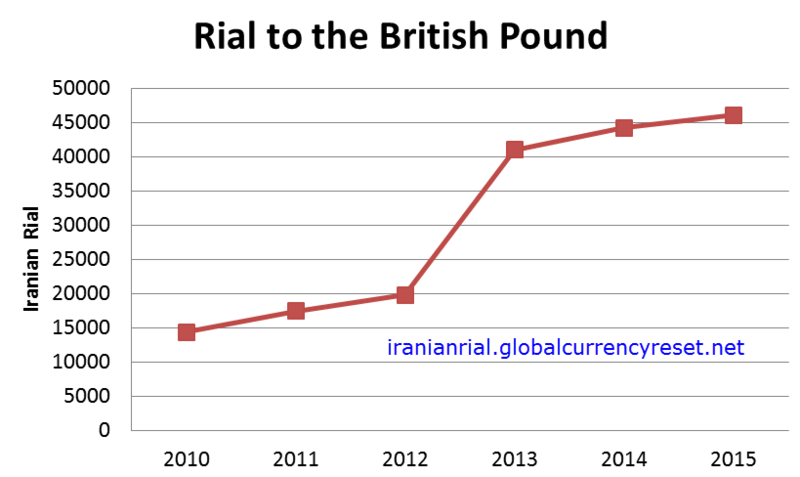 Many forex investors are eyeballing the IRR, the Iranian Rial is the official name of the currency of Iran. Although Iranians often express the amount of money they have in terms of “tomans.” Usually one “toman” is an equivalent of 10 rials. However, the official reference to money and prices of commodities is always in rials. 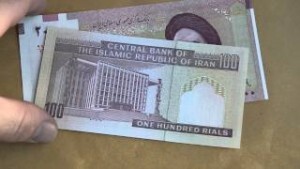 For example, although a store clerk may tell you that the price of bread is “10,000 tomens” the sign next to the loaf of bread will always read “100,000 Rials.”The Iranian Rial has no official symbol, but the Iranian standard ISIRI 820 is often used by typewriters to represent the currency. The two Iranian standards of ISIRI 3342 and ISIRI 2900 are often used as its character code. This article will not go into detail about how the global currency reset will affect the Iranian Rial as that topic will be discussed in an upcoming article. The Iranian rial was first introduced in 1798 as a coin equivalent to one-eighth of a tomen or worth 1250 dinar. In 1825, the government stopped issuing rial in favor of the Qiran, which represented 1000 dinars or one tenth of a toman. The rial was reintroduced in 1932 replacing the Qiran at par value. The exchange rate of the rial in 1932 with the British pound was one pound = 59.75 rials. This slid further down with the one pound being equivalent to 80.25 rials in 1936, then improved to 64.35 in 1939. In 1940, the exchange rate was one British pound equaled 68.8 rials and then jumped to 141 rials in 1941 and then 129 in 1942. Iran then switched its currency peg to the U.S dollar in 1945 starting with an exchange rate of 1 dollar= 32.25 rials. The rate changed to 1 dollar =75.75 in 1957 and with the devaluation of the dollar I 1973, the new exchange rate now was 1 dollar = 68.72 rials. This later changed in 1975. Following the Islamic revolution that was characterized by capital flight from the country, there was a deep decline in the currency of Iran. For instance, one U.S. dollar exchanged at 71.46 rials in 1978 and 9430 rials in 1999. Infusing sudden foreign exchange in the economy after the Islamic revolution resulted in what is commonly referred to as the Dutch disease. This led to a reduction in price competitiveness and hence a reduction in exports. It also causes a shape increase imports. All these affected the performance of the currency. To help manage the effects of the Dutch disease the rial has been tightly controlled by Iran’s central bank in years after the Islamic revolution. The government also has a tight control over the oil revenue and letters of credit. This controls the exchange rate of the rial, with the government allowing for the normal depreciation of about 4.6% to support non-oil exporters. 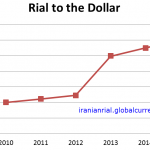 These ensured that the Rial remained relatively stable in the foreign exchange market until 2011 when the US and the EU effected sanctions against the county’s regime. This made the rial lose about two-thirds of its value against the US dollar. The period between 2010 and 2015 has been marked by a sharp decrease in the value of the Iranian currency against all the major currencies. This is particularly because of the international sanctions against the currency occasioned by Iran’s nuclear program. Iranian monitory policy that resulted in the devaluation of the rial in 2013 is also part of this issue. Previously, Iran’s capacity to get financing for investments and trade had been constrained because of lack of confidence in the country’s economy. While the poor domestic business environment and government policy may be to blame for the inflation, the international sanctions that have been imposed on the country are to blame for the recent loss of value for the rial. 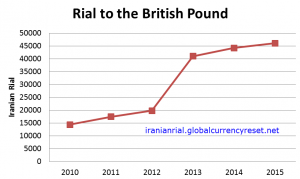 Reducing Iran’s access to the global finance market since 2010 has greatly impacted the value of its rial against all major currencies in the world. The period between 2010 and 2015 has been marked by sanctions on Iran by foreign powers, key among them the U.S and the EU, which adversely affected the exchange rate of the rial. For example, the U.S has instituted about four acts sanctioning Iran. These acts have had an adverse effect on the currency and the entire Forex market. The U.S acts sanctioning Iran include the FY 2013 NDAA of 2013, the Iran Threat Reduction, and Syria Human Rights Act signed in August 2012, the Comprehensive Iran Sanctions, Accountability, and Divestment Act signed in July 2010, and the FY 2012 NDAA of 2011. These sanctions have ensured that Iran’s monetary system is considered a money laundering entity by the international banking systems. This has had adverse effects on the rail leading to the multiple depreciation of the currency. Immediately after the enactment of sanctions against Iran by the U.S. government the Rial begun to sharply lose its value against the dollar. For the past five years, the Iranian economy has been imploding with, the rial being the biggest causality. For example, in 2012 alone Iran’s currency lost up to 80% of its value. The rial continued its downward trend against not just the dollar but all other major currencies, to in 2013 until it was officially devalued in July the same year. The EU also joined the US in putting sanctions on Iran, with its council passing six major sanctions against the country. The first came 2010 in the form of the Decisions 2010/413/CFSP, the 2011/235/CFSP of 2011, the 2012/35/CFSP of January 2012, the 2012/152/CFSP of March 2012, the 2012/168/CFSP of March 2012 and the 2012/365/CFSP of October 2012. All these sanctions targeted various sectors of the Iran economy, mainly the oil, and the financial sectors. This has greatly impacted the rial exchange rate for the past five years, thus making the Iranian rial lose close to three quotas of its initial value. 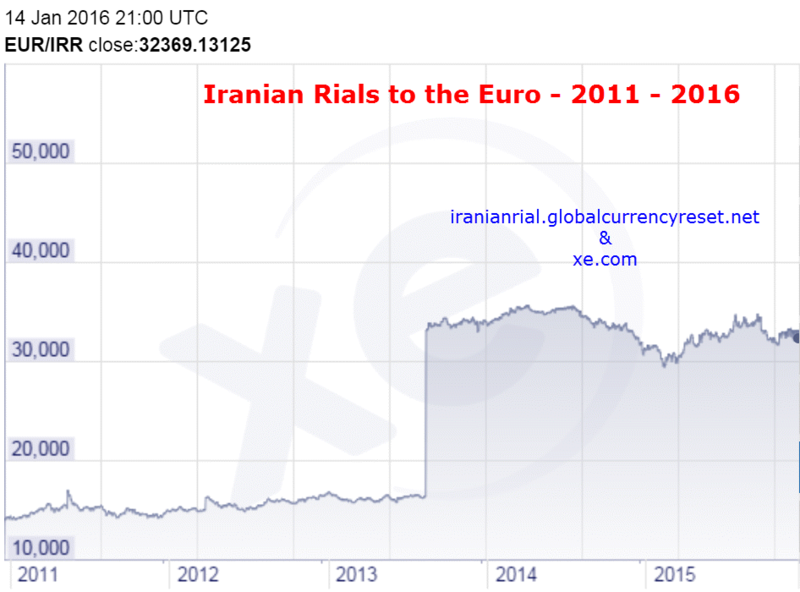 Sanctions against Iran by the EU has led to sharp drop in the value of the Iran’s rial since 2010. This is particularly because the country could not trade with its key business partners in Europe and could not access its revenues to fund its economy. As a result, the government has set up measures to try and curb further sliding south of its currency, but with an acute shortage of the Euro, this has not been successful. International financial sanctions have made it difficult for Iran to access its oil revenue in the past few years and have thrown the country into a financial crisis that has result in a sharp fall in the value of its rial against all major currencies such as the British pound. The graph above represents the number of rials that one needs to buy one sterling pound. Sanctions implemented by major world government meant that central bank of Iran could not supply the required foreign currencies. As a result, there developed an informal market that harkened the exchange rate. 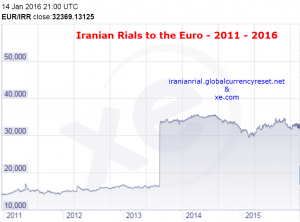 To stabilize the exchange rate the government had to devalue the rial in July 2013. The international financial sanction imposed against the Iran made it very difficult for the government of Iran to raise enough foreign currencies to pay for its imports, a situation that caused the demand for foreign currencies to surpass the supply thus resulting in the depreciation of the currency. The government policies are also to blame for the falling of the rial. The policy of the Iranian government to micromanage its monetary systems and to monetize its debt has also had a major effect on the depreciation of the Iranian currency. The pressure from the demand of foreign and the government policy have greatly contributed to the depreciation the rial between 2011 and 2015. For example, in 2009, the monetary policy in Iran advocated for the sale of more foreign currencies in order to curb depreciation and maintain the value of the rial at between 9700 and 9900 rials per U.S dollar. After the sanction begun in 2010, the government shifted to a policy of trying to intentionally weaken its currency by withholding the supply of hard currency so as to have a more rial dominated income especially when the government begun to face budget deficits. This created a wide gap between the official and the unofficial exchange rate that stood at over 20% in 2012. 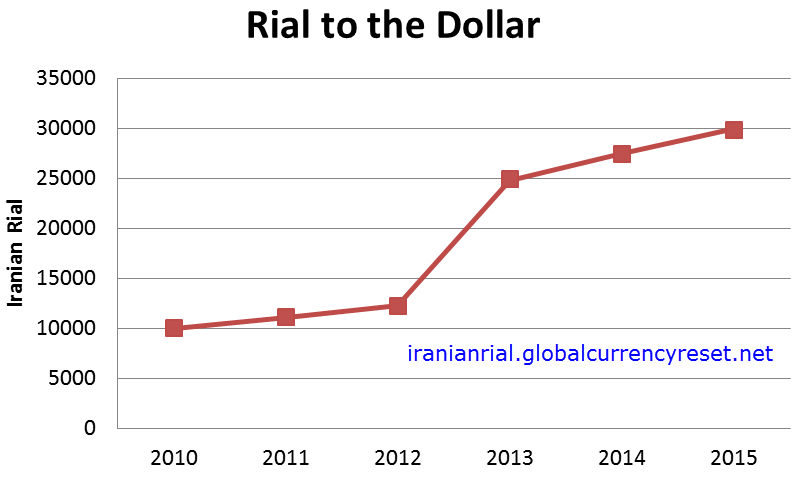 Following the international sanctions against the central bank of Iran in 2012, the exchange of US dollar against the rial study at 17,000 rials per dollar. This depreciation had some positive effects on the economy given the fact that it helped boost the competitiveness of Iran’s domestic products abroad. This made the unofficial rial exchange rate fluctuate especially when the mechanism that the bank uses to set interest rates were liberalized. Finally, the central bank of Iran decided to set the exchange rate of rial to the dollar at 12,260 rials but by September 2012, Iran’s rial had depreciated to a new low of 26, 500 to the US dollar. The rial further fell to 38,500 by October as a result of the market forces. The further decline in the value of the rial forced the government to officially devalue the rial in July 2013. On July 6th 2013, the Iran’s central bank announced a drastic devaluation of the rial in an effort to shore up the country’s faltering economy. 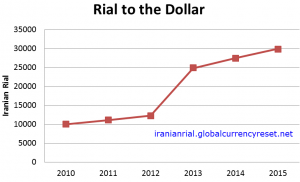 Prior to being officially devalued, the rial had shed off up to 80% of its value beginning 2012, when the impact of the harsh financial sanctions by the U.S and the EU begun taking shape. Before the devaluation of the rial, the central bank of Iran sold the US dollar at 24 779 rials, which was a subsidized rate for basic commodity importers. The subsidized rate, however, represented a 102% depreciation of the rial since January 2012. The new rate, however, was still lower than the actual value of the rial. Did help increase the availability of the dollar in the market, but was sufficient to stop further depreciation of the rial against major world currencies. With the signing of an interim agreement on the nuclear program with world powers, the Iran got a number of sanctions relief in late 2013, which helped shore up the rial for a short period of time. Prior to the imposition of sanctions by Western powers, Iran was a key exporter in the Middle East. Its key exports include the oil and gas, agricultural products and automobiles. Iran holds an estimate of about 10% of the world’s oil reserves. In addition, it is known to have the world’s third-largest oil reserves, behind Canada and Saudi Arabia. Most of its oil fields are in the southern region near its border with Iraq. Before the sanctions, Iran was the world’s second-largest oil producer, producing over four million barrels of oil each day, which was about 5% of the world’s production. Iran’s oil output has largely remained flat over the past few years, thanks to a number of factors. The government had set a target of 5 million barrels per day, but that has not been realized. The factors limiting Iran’s oil production includes the high rate of decline in mature natural oil fields in the Middle East and the low oil field recovery rates. It is estimated that quite a huge chunk of Iran’s oil is lost annually as a result of damage to oil reservoirs. In addition to these declines, Iran has for a long time suffered from structural and technological hick ups. Iran relies heavily on old technology to run its oil production. This heavily limits the country from reaching it full oil production potential. In addition, the sanctions imposed by the US and other Western powers have made sure that no other country can invest in Iran’s oil production this limiting the capacity of the country to produce more oil. The sanctions also limit the country’s oil market which dampens the desire to produce and export more oil. Other than oil Iran is also know to have the world’s second largest gas reserve, which is estimated to be about 15% of the world’s total reserves. Despite these huge reserves, Iran is not a major gas exporter. In fact, it used to import gas up to about 2005 when it begun exporting its natural gas to the European and the Asian markets among other places. The country has been shopping for international investment to help in the development of its natural gas segment of the economy in the recent past. However, the international sanctions imposed by the US and he EU has made it impossible for any prospective investor to step forward with the appropriate technology for the production of liquefied gas. This is particularly because a small group of American and Japanese companies that cannot violet the international sanctions against Iran own the patents to all the necessary technologies. The government controls the oil and gas sector, and this has been a big stabling block in the advancement of the sector. The country, however, began the process of privatization of over 50 oil and gas companies that were previously owned by the state. The companies will be listed on the Tehran stock exchange where both foreign and domestic investors can play a role in their management. Privatization may help bring in the required technology and expertise to increase production and management of the sector. Iran is a major export of both Pistachio and cavier nuts. These are in fact the country’s major non-oil exports. Although the production of agricultural products in Iran is often affected by periodic droughts, nuts are drought resistant and earn the country and additional foreign exchange when exported. Iran also invests heavily in agriculture using the oil revenue to reduce over-reliance on imports. An Executive Order signed and issued by the president of the United States on June 3rd 2013, that supplemented the IFCA sanctions imposes penalties on any non-US financial body that conducts business in Iranian Rials. According to theorder, effective July first 2013, any non-US monetary institution that trades in Iranian rials risks being denied a US corresponded account if it is proved that the institution conducted a significant transaction in Iranian rials, conducted a transaction related to the purchase or sale of Iranian rials, or maintained an account with a significant amount of Iranian rials. The Iranian FinancialSanctions Regulations (IFSR), that restrengthened in February 2012 with the implementation of the subsection 1245(d), extended sanctions to any non-US institution that facilitates significant financial transactions with the Iranian central bank or any listed Iranian financial institutions. This simply implied that any foreign institution cannot trade with an Iranian based financial institution which limits trading in Iranian rials. The executive order 13599 issued by President Barack Obama of the United States on February 5th 2012, among things curtail trading in the Iranian rial. The order set out to implement section 1245 of the 2012’s FY2012 NDAA that sought to free all the assists of the government of Iran and thus stop all the financial assets of Iran based in the US from being shipped back home. The order also opened the door for the implementation of new sections that directed all banks in the US to seize all funds passing through them as long as they belong specially designated persons list. This requirement simply means that no trading in rials can be done with people on the Specially Designated Nationals list even if the funds are meant for non-sectioned products. The EU also restricts the transfer of funds and trading in Iranian rials. Article 10 of the Council Decision number 2010/413/CFSP and articles30, 30a, 30b and 31 of the Council Regulation number (EU) No 267/2012) of 2012 prohibits monetary transfer between financial institutions based in Iran and those within the These restrictions also include the prohibition to trade with the central bank of Iran. This is the first step in preventing the exchange of Iranian rials. In addition, the sanctions prevent financial exchanges of any kind between institutions in the EU with any other outside Iran whose parent company is based in Iran. Furthermore, there are restrictions on financial exchanges between any EU institution with an institution elsewhere in the world but whose control comes from Iran. These measures are in place to cut Iran’s financial muscle but also make the Iranian rial lose value as they restrict trading in it. The Iranian rial is issued by the central bank of Iran. In 1932 when the rial was reintroduced, the Bank Melli Iran issued it in denominations of 5, 10, 20, 50, 100 and 500 rial. In 1935, the 1000-rials note was introduced then a 200-rial note followed in 1951 and the 10,000 and 5000 rial notes in 1952. The 5 and 10-rial notes have not been used for over a half a century. The 5-rial notes were issued for the last time in the 1940s while the 10-rial notes were last issued in the 1960s. The central bank of Iran begun issuing banks notes in 1961, replacing the Bank Melli Iran. After the Islamic revolution, the CBI began issuing notes in the denominations of 100, 200, 500, 1000, 5000, and 10,000-rial notes. In 1986, the 2000-rial notes were issued for the first time. Although there were proposals to issue notes larger than 10, 000 rial in value by 1989 and even the central bank of Iran request for the permission to issue such notes, fears of counterfeiting and inflation prevent such a move. The 20,000-rial note was introduced in 2005 and then closely followed by the 50,000-rial notes. The largest rial note is that of 100,000 rials. For the high amount, there are the Iran cheque of 500,000 rials and 1,000,000 rials that freely circulate and are often regarded as cash. 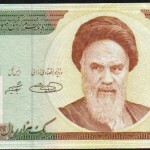 All the Iranian rial banknotes of 1000 and above have the portrait of Ayatollah Khomeni, founder of the Islamic Republic of Iran. This makes it easy to tell the value of a note. Before you purchase the Iranian Rial, make sure you research and find the best prices. Sanctions have ended as of January 17, 2016. Thank you for your attention, please share this article. The Iranian Rial is one of the most worthless currencies in the world. The 100,000 Rial banknote is only worth $3.33 as of 10/2/2015. This is the highest currency note they have. There are 500,000 and 1,000,000 notes called Iranian Cheques which are used in the same way as cash. On Monday, September 14, 2015, Iran’s Rial slipped to 35k per 1 USD. It was 29k per 1 USD around this time in 2013, so it’s becoming weaker with each passing year. What this recent fall shows me is that the economy of Iran is still quite weak, fragile if you will, and the government of Rouhani has literally no way to better the currency economic situation in the country. For those investors who think now is a good time to purchase the Iranian currency, you might want to reconsider, especially since it’s illegal to purchase the currency under current US sanctions. Fars, which is their state-run news agency, has stated that now, in September/October 2015, that this is the highest exchange rate against the dollar we have seen in at least the last 2 years. The current budget deficit for Iran has now reached 50% for 2015. This is according to Mohammad Bagher Nobakht, who is the current head of Iran’s MPO (Management and Planning Organization). The plunging in the prices of oil over the last year are a contributing factor. Oil is now about $40 per barrel, and some analysts have stated it could drop to near $30. Numerous analysts, people who study the Iranian markets and economy, feel that even if oil prices did not drop, even if they were much higher, Iran would still have issues with their economy and bankruptcy. The war in Syria and also Iran’s backing of the Houthis group (located in Yemen, who are associated with the Quds in Iraq) have not helped their currency. The price of Iranian oil was estimated at $70 a barrel when Hassan Rouhani’s administration set this year’s budget; but oil prices now stand at $40 a barrel. Finally, and possibly something to consider, most of Iran’s current economy is based upon corruption, and unless that goes away, the Iranian Rial will continue to remain weak. The nuclear deal between Iran and the US (as well as five other world leaders) which took place in July of this year, reduced the price of foreign money as well as gold, so it appeared the Rial was starting to strengthen, but alas, it didn’t last. Shortly after the Rial’s appreciating it lost its gains. Many experts thought this nuclear deal would help the economy, but since Iran is currently experiencing severe stagnation, the economy has not recovered.